Na`Vi have announced today that Russian legend Dimitriy 'LighTofHeaveN' Kupriyanov will take some time off from the team as the Captain of Mousesports, German legend Kuro 'KuroKy' Takhasomi joins instead. This news comes only one day after Gleb 'Funn1k' Lipatnikov joined the squad in place of Sergey 'Ars-Art' Revin. In the wake of the announcement, Light has said that he will take some time away from the game in order to attend to his personal life. This leaves the door open for the possibility that we will see the living legend return prior to The International 3, as without a doubt he will have several doors open to him when he chooses to return. LighTofHeaveN has been a fixture of the Dota scene since his days in SAY_PLZ when he elevated the level of carry play in the west, through his days in Virtus.Pro with Ivan 'Vigoss' Shinkarev, Rush3D together with Yaroslav 'NS' Kuznetsov and on to the famous DTS of 2009-2010 fame. When DTS dissolved, Light headed off to Moscow 5, from where Na`Vi finally purchased him for $2,000, ushering in the era of Na`Vi dominance. Light did not only define the carry role back in the day and the off-lane position in Dota 2, but has played every role, every hero, throughout one of the most successful careers. Gods of DotA have come and gone, and as they faded away into obscurity, Light remained. Always one of the best players on the scene. Always dependable. Always a steady performer. The most consistent man of Dota, he commands the respect of players across the globe, especially among the Chinese, who will always have a soft spot for Brother Light. In his place Na`Vi have today acquired another living legend, former longtime teammate and friend of Captain Clement 'Puppey' Ivanov. Kuroky and Puppey first met up when Mousesports was in need of players back in 2009, but shortly after the duo moved back to KS.Int, the team which Puppey had left for a short while due to a slump in activity. The duo would stay together through Nirvana.Int, NWO and GGnet, before parting ways in 2011 as Puppey joined up with Na`Vi at the same time as they acquired LighTofHeaveN. Over these two years, Kuroky and Puppey developed quite the bromance, with Kuroky penning many heartfelt blogs to his good friend, and as they parted ways, expressing his wish that they would once more get to play together. Indeed, as Kuroky returned to the scene after an absence following The International 2011, he famously stated that he wished to join a team like Na`Vi, and after a year in waiting, he has finally had his wish fulfilled. While yesterday things looked a lot less clear as to how the new Na`Vi squad was likely to play, today it seems more clear, as Kuroky has risen over recent months to become a formidable support player and will complement Puppey well. This leaves Funn1k to take up the off-lane once held by LighTofHeaveN, although we may still see more movement than in the past, especially if Puppey decides to allow Funn1k to continue playing his famous Wisp, or whether Puppey or Kuroky will pick it up, as all three of them have played it for their respective teams. Today I announce that one of our players will be going inactive - Dmitriy "LighTofHeaveN" Kupriyanov. Dima is an extraordinary player and person who will be missed in Na`Vi. He will always be remembered for what he has done to this team. 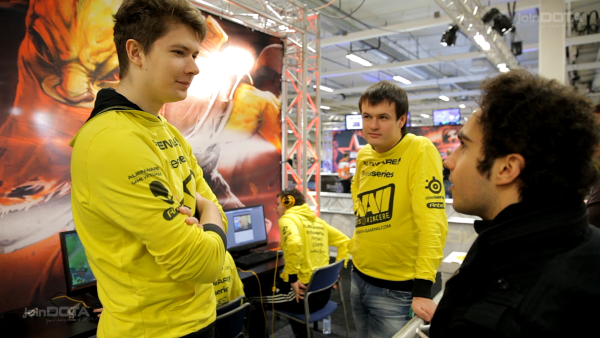 Once again we bring new blood and friendship to the team, I welcome you Na`Vi.KuroKy. Another remarkable player and a person that has been my friend for as long as I can remember playing this game. The time to prove ourselves has started once more. First of all I want to thank both Sergey and Dmitriy for their immense contribution to the team's progress and all those victories we were able to achieve all together. These players deserve tons of respects from all of our fans because there would be no Na`Vi we know today. Secondly I ask you to understand that we did not look for easy decisions. But sometimes further progress require some changes as the team stopped to move forward approximately a year ago. Some players lost their motivation, some did not want to practice. There were different reasons for that and everyone bears the same burden with no exceptions. This is how the situation looks like, no excuses. Now let's move forward to our new players: Funn1k and Kuroky. I am sure that they will help us not only to maintain the level of play we are used to we will improve even more. The team will treat the practice process and their matches differently which will eventually effect the end results. Thanks to Mouz for their invaluable support and a great time as a team. I do not know what lies ahead, but I choose this path.